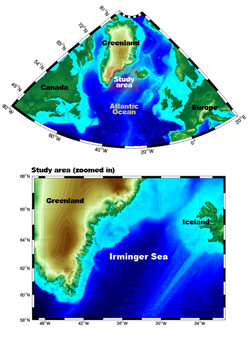 Map of the North Atlantic Ocean, showing the Irminger Sea study area in between Greenland and Iceland. Welcome everyone! We're excited to have you follow along on our cruise aboard the Research Vessel Knorr to the Irminger Sea. Some of you are among the school children from four different countries who will be tracking our progress and learning more about oceanography, climate, and life on a research vessel. Where is the Irminger Sea you might ask? It is located between southern Greenland and Iceland, and it turns out to be an important place in terms of our climate. We will be sailing in the western Irminger Sea, and then going farther north, collecting information about the water and also about the atmosphere. This is one of the stormiest places in the world, and we are trying to learn more about how the storms influence the ocean. Hopefully, though, we won't see too many storms because it is difficult to work when the waves get too high! We will also see some pack-ice and icebergs (and hopefully some views of majestic Greenland). But, we need to be careful, because the Knorr is not an ice-strengthened ship. So we will try to get close to the ice edge---but not too close. Last September we sailed on an Icelandic vessel called the Arni Fridriksson, and we put moorings in the water to take measurements all through the winter. This was risky, not only because the icebergs and storms could damage the moorings, but because commercial fishermen could run into them. So I've had my fingers crossed for a whole year, hoping that the moorings will be there when we return. I can't wait to find out. After we retrieve the moorings, we will steam northward to learn more about how the cold, northern waters enter the Irminger Sea. Our cruise will be even more exciting knowing that you are following along. 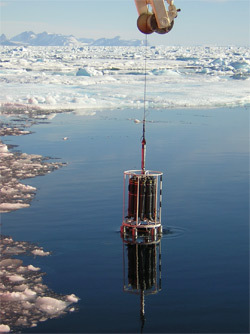 I hope that you ask lots of questions during our journey, and that you become as fascinated about oceanography as I am. Click here to see exactly where the Knorr is on this automatically updated map.